We offer a high quality range of Hot Dip Galvanized Nuts which have been fabricated using high graded raw material to provide best durability & low maintenance. Our professionals understand the actual needs of different industries & sectors and make sure to design the entire range of products accordingly. 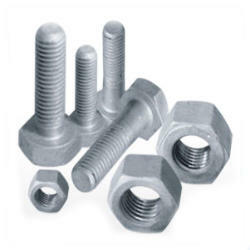 Wheel Nut and Bolts ludhiana, Flange Nut, Leaf Spring Bolt, Fasteners Exports India, ISO TS Fasteners Manufacturer, ...Hot DipGalvanized Nuts and Bolts. We manufacture and supply a wide range of Hot Dip Galvanized Nuts that are iron or steel coated, ensuring optimum resistance to corrosion and abrasion. These are available in various technical specifications that can be customized within committed time frame as per the requirements of the clients. - Diameter : M6 to M48/1/4" to 2"
- Length Range : 20 mm to 300 mm 3/4" to 24"
- Grade : 4.6, 4.8, 5.6, 8.8, 10.9, 12.9, 8.8S, 10.9S , R.S.T.V.X etc. We are delicately involved in providing an excellent quality array of Hex Nut for catering the various needs of our clients. Hot Dip Galvanized Nuts are being manufactured by us. These products are designed in best industrial conditions understanding the actual needs and requirements of its usability. The products are manufactured using high grade raw materials, which are abrasion and corrosion resistant. Iron and steel coating on these products make them highly durable and long lasting. 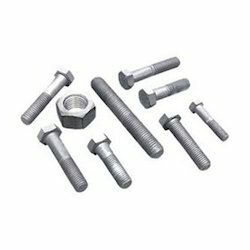 Engaged in Dealing a wide range of Hot Dip Galvanized Bolts & Nuts. These are made in accordance to various industrial standards to offer high functionality. These products offered by us are made from high quality raw materials to offer high consistency and long service life. We offer these products at market leading rate.